The sun seems to have an anger management problem. From time to time violent outbursts of gas occur in the outer surface of the sun. These "solar temper tantrums" are thought to be caused by the reconnection of magnetic fields with differently organized atoms (opposite polarity). The first 3D image of a jet of gas propelling out of the sun's surface (pictured) has recently been constructed. 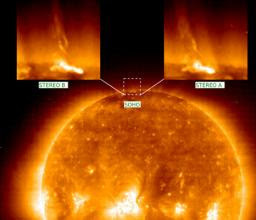 Researchers used NASA's twin STEREO spacecraft to view the sun from different perspectives. Turns out the jet has a helical shape, like a screw or a spiral staircase. Spirally jets are good news for theorists, who propose that the sun's violent outbursts are caused by twisted loops of magnetic fields that rise up from the sun's surface. These magnetic loops are thought to abruptly break apart and reconnect with nearby fields, kind of like how kids (or a good portion of adults) snap legos apart and reassemble them. The two identical observatories that make up STEREO are designed to track the flow of energy and matter from the sun to the earth, and its images provide the first graphic evidence of looped magnetic fields. Understanding jets might lead to greater understanding of the larger, satellite damaging, power grid disrupting, solar eruptions called coronal mass ejections.